Most children lose their first tooth around the age of six or seven years old, but it can happen as early as four or five years old for some early birds. The primary (or “baby”) teeth are usually lost in the order that they came in, which means that the first tooth to fall out will probably be the lower incisors, or the two front ones. Next will be the two front teeth in the upper jaw. After the initial spurt when 8 teeth come out, your child will have about a two-year period when no teeth are lost (usually between ages 8 and 10). This is typically completely normal, and tooth loss will resume again with the molars and premolars around the age of 10 and up. You shouldn’t need to do anything to do anything to help the process along, and indeed pulling a tooth too early can be a bad thing. Your child will probably be more than happy to wiggle a loose tooth until it comes out on its own or while eating. Definitely avoid traumatic methods like yanking a loose tooth out with a string, as this can damage the gums or the tooth underneath. If you are really concerned about a tooth that is loose but won’t come out, please call our office. Occasionally certain issues can occur that may delay the proper eruption of the permanent teeth. Dr. Fowler’s team can take X-rays to identify what is going on beneath the visible surface and recommend possible interventions if needed. Most of the time, your child’s permanent teeth will come in on their own without any help from you. As your child loses teeth, remind them that it is as important as ever to continue brushing and flossing regularly to keep their smile healthy and their teeth functioning properly. And if you have any questions along the way, do not hesitate to call our office! Dr. Allison Fowler is the Preston Hollow dentist that families and friends trust with their favorite little smiles. 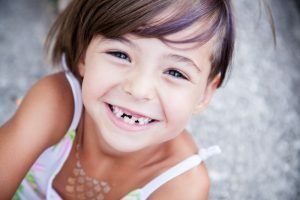 If you are concerned about the development of your child’s teeth, get in touch with her office by calling 214-368-0018 today!